Many people seem to think RV interiors are cheap, poorly built, and of low quality. The good news is that this conception is both outdated and completely untrue. We’ve put together this list of features to surprise those of you with negative ideas about RV interiors. Check out the amazing RV interiors and features below for a sneak peek into the amazing world of RV living. First, and most importantly, let’s address RV furniture. 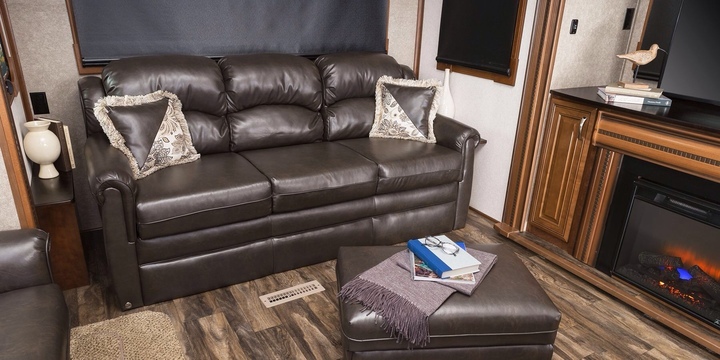 Couches, upholstered chairs, and mattresses in RVs have gotten increasingly more comfortable and attractive in recent years. In fact, we would go so far as to say that there is very little difference between RV furniture and the furniture in an average house at this point. This means motorhomes and trailers are not only better to look at, they are nicer to hang out and sleep in too–highly important in our opinion. A great many RVs offer a dinette in place of a traditional table and chairs. The problem with this is that the dinettes are rarely as comfortable as a regular dining set would be. Fortunately, RV manufacturers have taken note of this, and many are putting out models with real dining sets in place of the usual dinette. 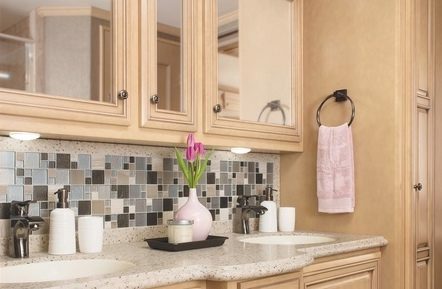 More and more, RV manufacturers are taking up installing beautiful, high-quality cabinetry. 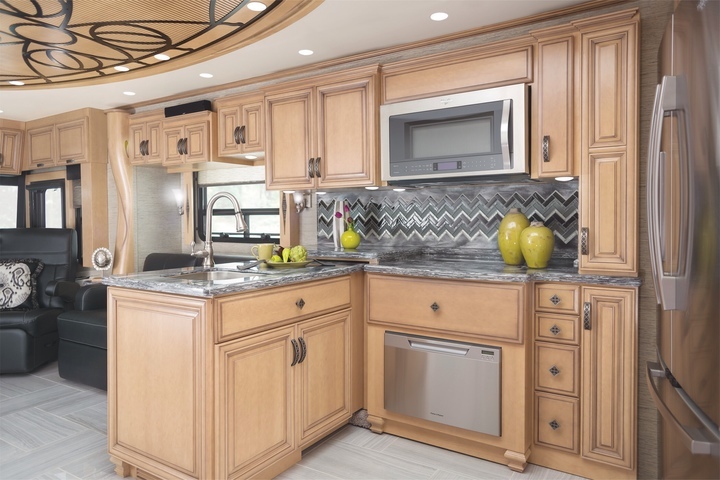 Because most RVs have cabinetry throughout, this decision really does lead to a luxurious feel and provides the owner with a nice product that is likely to last for a good many years. 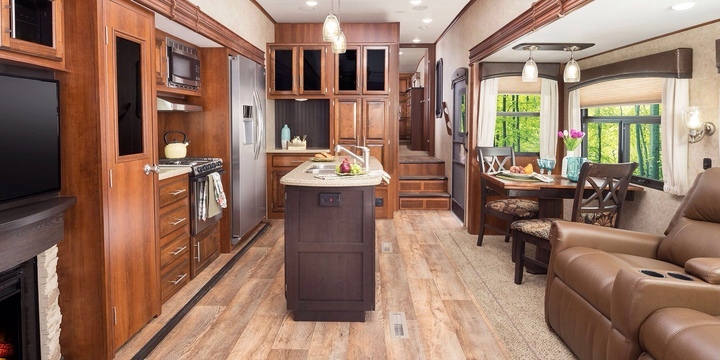 Lovely backsplashes, faux wood floors, soothing color palettes, modern drawer pulls, and sleek plumbing fixtures all add to the comfortable, contemporary, and luxurious vibe of the modern RV. Best of all, most of these things are found in RVs of all classes and in every price range, meaning that even a budget travel trailer will offer some nice touches to its inhabitants. The use of LED lighting in modern RVs has proven to be a wonderful idea. These lights save energy, give off very little heat, and light up the interior of an RV quite nicely. To make a good thing even better, modern RV LED light fixtures are much more attractive than the fixtures of years past. 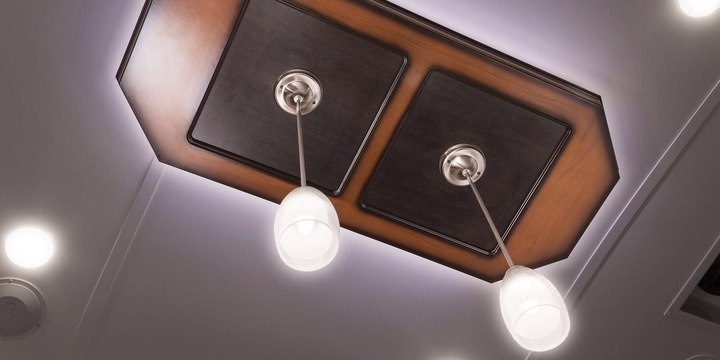 Additionally, these lights are being used inside of cabinetry in many models, making it easy to find whatever you may be looking for. For some people, certain chores–such as washing all their dishes by hand and visiting laundromats to clean their clothes–are the stuff of nightmares. Fortunately, by choosing your RV carefully, you can skip those sorts of chores thanks to the inclusion of washers, dryers, and even dishwashers in many modern RVs. As you can see, the modern RV is truly a comfortable place to be, meaning the modern traveler needn’t want for anything. Don’t believe us? 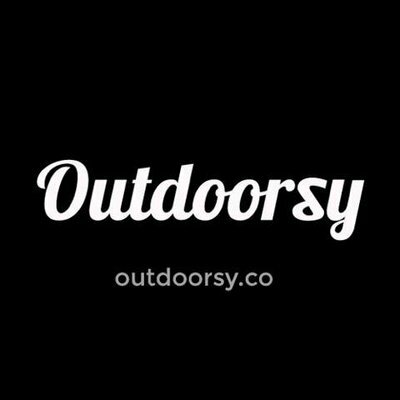 Check out the many trailers and motorhomes listed on our site. We are certain you will find something to suit your needs just fine.